Social media marketing holds incredible power in today’s business climate. It’s not only a platform that hosts conversations for friends, family, and old acquaintances – it has become our central hub of information for personal and professional use. Most people have a general idea how social media works; however, few have a comprehensive understanding of the type of mistakes that can be made. Check out these 10 tips to get a better handle on your social media efforts, maintain that audience you’ve worked so hard to build, and avoid these common blunders! Posting irregularly or once or twice a week typically isn’t enough to stay on the minds of your audience so that you’ll be their primary source in their time of need. Regularly provide them with content that meets their needs and interests (content they can identify with or even rally against), rather than bombarding them with non-benefit driven promotions. Not responding to audience inquiries or relevant comments is a HUGE mistake. The reason is quite obvious: a response is a fundamental customer service expectation. If a customer calls your place of business with an inquiry, you know their tolerance for being put on hold is very low. Don’t put your followers on hold. Be proactive by responding to your social media followers’ inquiries both on and off your page to make a connection with your audience. Competition is fierce. To survive, you must go beyond the norm and innovate or risk becoming obsolete. Be creative – grab your audience’s attention through humor, shock, motivation, and even give them an offer they can’t refuse. Give them a chance to ask the right questions, shock and awe them, and surprise them with something unique. You’re off to a good start by reading this post, but it’s important to be mindful of what your competition is doing. Nearly everyone has adopted social media as a marketing weapon, so educating yourself on what “the other guy” is cooking up will help you generate ideas and innovate for your own success. Take good notes on what is working for them or looks appealing, and brainstorm some ideas of your own original content that will wow audiences even more. It’s safe to say most people don’t look forward to negative comments or feedback, whether in person or in writing. In social media, this can get out of hand because people have the advantage of speaking freely without penalty or posting anonymously, so they have no reason to hold back. It’s important to focus on the “quality feedback” and constructive criticism, not just honing in on the negative and acting out. Feedback will help discover weak links and create opportunities. Good promotion entails advertising to the right crowd, at the right time, and without pushing their “off” buttons. Think about your favorite TV commercials you have enjoyed watching. Would you still have respect for the product being advertised if the same commercial was advertised every 5 minutes? Too much of anything can harm your business. Be original and have adequate timing to avoid annoying your customers. Marketing in only one department limits the multi-functional role that it can have on your business. Different agencies that are the most useful are: advertising, media buying, web development, SEO, PR and customer experience. This should be shared across your company so competitors and customers know you mean business, and see you aren’t limited to strictly 1 area of a marketing push. Get out of your comfort zone and try something new. This will help you in the long run and will help you establish a clear and varied road map for success. You have to figure out what type of social network fits you and your business. For some companies with limited time to dedicate to social media marketing, it can be frustrating to try to keep up with every hot new social media platform available. Use the platforms your audience is most active on to avoid wasting time as well as have clear goals and a solid content strategy for each platform. Having a goal and understanding what you’re doing on social media sites is one thing, but keeping track of everything you’re doing is equally important. Every click, like, new follower, article read or purchase can and should be tracked for your own benefit. Research the best ways to track and use this data so you can stay competitive and know what strategies are working. Sites like Hubspot have amazing tools to track how successful different social media platforms are and can recommend changes for your business. You’ll get about as much engagement out of a stone as you will by buying followers. Not only that, but it will jeopardize your account as more social media pages are taking action against unnatural practices. As long as you follow the above tips in social media marketing, you will never have to resort to “cheating” tactics like paying for fans, likes, views or any other campaign that will increase your fanbase. What mistakes would you like to add to this list? Questions? Comments? Share your feedback – we’d love to hear from you! Social Media Marketing is the emerging concept to boost the popularity on social media and increase the sales volume rapidly. Very insightful, thank you. Tell me, if, I have several accounts, I mean, the same me, and when I post, I go to those different accounts and click likes and comments – will it be good or bad? Are you saying you have more than one EzineArticles account? Please note, we are only able to accept one account per person. Our Member Support Team will be contacting you to assist you in combining these. This should be good because you are commenting as the same person. There is no cheating. However it will be better to combine these accounts togehter. It will save your time and effort. I think Princey meant several social media accounts not EzineArticles accounts. My view, you shouldn’t do that if you are after improving on your social media presence and reputation as it is likely to be counterproductive if your followers discover. Just post interesting stuff that will trigger interest from your social media community. My take. To understand the mistakes and to take corrective steps are rightly emphasised here. Thanks for this. Thanks for this helpful post. I am new to social media marketing as well as article marketing. I have worked offline but i am facing difficulty in handling online matters. It’s hard for me to decide which social media should i choose? Currently i am usinig facebook and google plus. What should i do to attract audience and friends? Any help? Do you want to appear successful or actually be successful? I always advise my clients NOT to buy fans on Facebook. You have to remember the value of a real client. A purchased Like will never buy your product or visit your store. I belong to a number of Facebook group that allow promotional marketing posts. But the blasts to these sites all the time by authors hocking their books is becoming annoying. I don’t want to be annoying. Do you have a strategy to stay current in their minds without overloading them with my book? I belong to a number of Facebook promotional groups and like you said in your article, the number of authors flooding the groups with the same thing over and over again is becoming tiresome. How can I promote on these groups without becoming annoying? One thing I think you could add to this list is being aware of time zones when Tweeting. We have many followers @WingSideUp that are older and don’t actually have Twitter installed but choose to get our updates via SMS. We often cover west coast motorsports and have to be very aware of our east coast followers. Having your phone go off at 2am if you are on the east coast can be VERY annoying. This is also true for any follower that has push notifications set up. One other thing that I’m truly not fond of is people that fail to respond to @ mentions and only RT. Sometimes it’s important to respond with a QT to let your followers know that you actually care about them. Finally-we’ve seen many motorsport facilities Tweeting race updates on Facebook. Very poor idea as it’s extremely spammy and in the long run actually hurts your FB credibility because of the way people tune out. Great article on the basics here. Thank you EzineArticles! Great point, Bob. We must consider the time zone our audience is in prior to posting to ensure we are directly reaching our customers with our messages at the appropriate times. I think an additional point is to “remain professional”. While one can exhibit a sense of humour, character etc, it is important not to let a business SM activity slip too far into a personal activity. For example while it is okay to use slang language in personal communication, it is inappropriate (or should be) in professional communication. I appreciate your contributions to our discussions. I almost never take negative feedback seriously. To me, it just lets me know that i’m doing my marketing right. Otherwise… i wouldn’t have anybody to reach – thus… no negative feedback. Randall, the point is not to take negative feedback “too seriously.” Good business operators should take feedback seriously to determine if it is legitimate, justified and whether it needs correcting. If you don’t listen to your customers you keep repeating the same mistakes. Why would anyone give negative feedback unless you were in some political fight? Gads that whole thing makes me nuts and has caused me to pull back from the news even. Nobody is changing anyone’s core beliefs anyway. I play it light lately.. la de da. People are sad and struggling enough. Receiving negative feedback? I delete and most often block them. I don’t put up with that s–t anymore. Thanks for the information! :) Totally agree with these tips. Keeping up with social media can be awesome, and rightfully so! And just as your plan starts to work, innovative updates get unrestricted and you have to regulate everything. One more: spamming your own wall with boring marketing posts after every hour, its utterly annoying! This is a great article about Social media. I am starting an online business with affiliate marketing. I would like some ideas on how to promote on facebook and twitter. Paying for baclinks and traffic should be included in the 10th tip. These are great outlines to follow and always keep in mind. Of course, the negative can break into your business, but it’s up to you not to let yourself down ..
Never pay for social traffic or participate in the “like my page I will like your page” sites. It is garbage fans. If the point of fans and followers is to cultivate paying customers down the road why would you pay for them? sorry personal pet peeve. Great article, I liked that you called out the importance of the conversational part of social media not just blasting out updates like some brands do. I feel as uncomfortable using social media for something other than social as I did when I was in real estate- encouraged and expected to use my circle of friends to get business- feels like compromising genuine friendships with business intentions. I prefer to focus on content and keywords and let the world find me if they want what I have to offer. BTW, I love the EzineArticles platform. Thanks for all you do! I need to start doing some social networking for my new constrution business, would you say that would be good for my trade? what can you advise me about it? Social Media Marketing refers to the procedure of gaining website traffic or notice during social media sites. 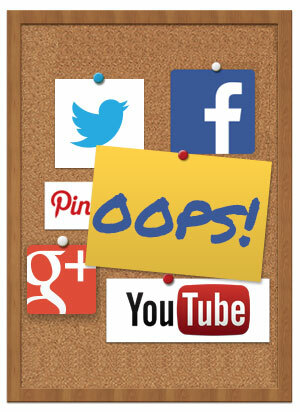 Thanks for share social media marketing mistake which is helpful for us. Brands cannot afford to make these mistakes on social media, it would damage their online reputation. “Too much involvement” is a great one. We often get too bogged down with just one method of marketing, when in reality social media (just as much as article marketing) only really works in tandem with a fully rounded marketing campaign. Now a days social media is the best place to earn good amount of traffic for any kind of blog and article or even site. As a SEO executive i bow for your article… it really helped me to boost my social media presence.